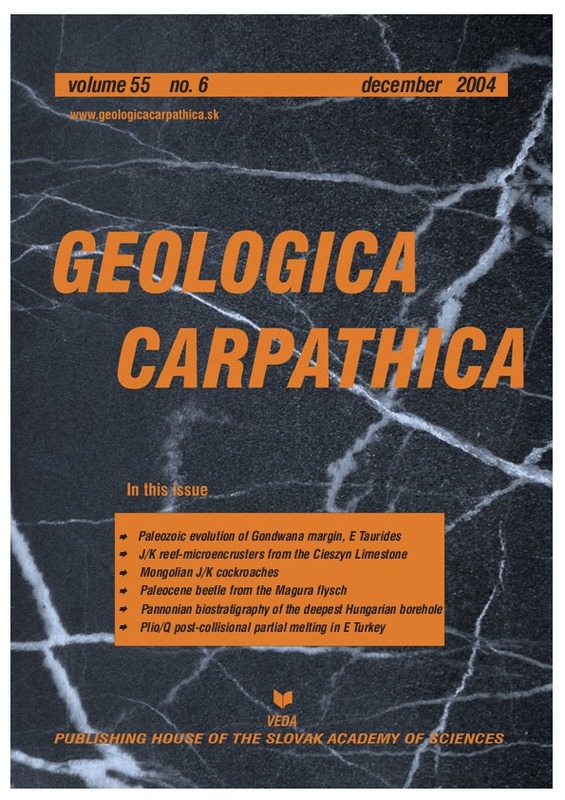 Abstract: The stratigraphy of the Geyik Dağı Unit of the Eastern Taurides has been revised on the basis of new field observations from this critical tectono-stratigraphic unit. The Emirgazi Formation, of Precambrian age, is shown to occur throughout the whole Tauride Belt. The Çal Tepe Formation probably reaches the Upper Cambrian. The Cambrian-Ordovician boundary is close to the base of the Seydisehir Formation; the latter includes mixed carbonate-siliciclastic tempestites. Its upper part may be of late Middle Ordovician age. The stratigraphic gap between the Seydisehir and Sort Tepe Formations is the result of a thermal event, as recorded in many other places in the peri-Gondwanan terranes of Europe. The graptolite-bearing black shales of the Puscu Tepe Shale Formation of early Silurian age, overlying the glacier-related sediments of the Halit Yaylası Formation is a typical unit in most of the peri-Gondwanan terranes in S Europe and N Africa. The “Orthoceras Limestones” of the overlying Yukarı Yayla Formation are of latest Llandovery to earliest Wenlock and post–middle Ludlow age. The Lower Devonian basal quartzites of the Ayı Tepesi Formation are interpreted as overlying an unconformity, which may coincide with the stepwise detachment of some small microcontinents from Gondwana accompanying the opening of Paleotethys. The conformably overlying Safak Tepe Formation yielded Eifelian–Givetian conodonts and is overlain by the Gümüsali Formation of Frasnian–Famennian age. The Devonian-Carboniferous boundary is located within the black shales of the Ziyarettepe Formation. The deposition of these black shales seems to be related to an anoxic event. Although the available geological data in the Taurides are still too fragmentary to provide a comprehensive picture, the new findings may facilitate the correlation of the Eastern Tauride stratigraphic units with corresponding strata in the Central and Western Taurides and improve the understanding of Early to middle Paleozoic events in NE peri-Gondwana. Abstract: Debris-flow sediments belonging to the Upper Cieszyn Limestone (Berriasian) are exposed near Żywiec (Polish part of the Outer Western Carpathians). The debris-flow sediments include clasts of bioclastic limestones (boundstones) derived from both microbial-sponge mud mounds and coral-algal reefs. The microencruster assemblage Lithocodium aggregatum–Bacinella irregularis has been found in clasts from coral-algal reefs. This assemblage unequivocally proves the presence of shallowing-upward reefal sequences on the Silesian Ridge. The development of the coral-algal reefs was probably a consequence of intense aggradational growth of microbolite-sponge mud mounds, accompanied by intense uplift movements of the neo-Cimmerian phase. Abstract: A unique Upper Jurassic assemblage of cockroaches with 7 new and one unidentified species occurs in the Shar-Teg in Mongolia (Shartegoblattina elongata gen. et sp. nov., Elisamoides mantiformis gen. et sp. nov., Breviblattina minor gen. et sp. nov., Mongolblatta accurata gen. et sp. nov., Blattula mongolica sp. nov., Blattula vidlickai sp. nov., Elisama pterostigmata sp. nov.). The assemblage is the most progressive among Jurassic sites worldwide and displays taxa characteristic for the warm and dry Lower Cretaceous assemblages: a mantid species, two species of Blattulidae represented by Blattula–Elisama complex (in the Cretaceous replaced by two sister and additional species of Elisama) including small representatives which probably occupied the niche of the Cretaceous Holocompsidae–Vitisminae, and diverse Mesoblattinidae. Additional aberrant species preliminarily placed in the Liberiblattinidae display strong synapomorphies with the mantises. Mesoblattinidae are also known from the Lower Jurassic of Europe and Upper Jurassic of Asia and Africa (generally less diverse assemblages). These assemblages are characterized by the diverse Caloblattinidae and also the Blattulidae, which are also present in Shar-Teg. The assemblage contains a similar ratio of fore- and hindwings probably resulting from an active decomposition. The presence of frequent malformations — vein fusions in different independent taxa, which indicates some ecological stress factors in the paleoenvironment — is unusual. Abstract: The first record of an insect (Coleoptera: Adephaga) from the base of Paleocene marine deposits in the Outer Flysch Carpathians of eastern Moravia (Czech Republic) is described. Its familial attribution to Gyrinidae or Haliplidae is critically discussed in comparison to fossil and recent representatives. The presence of a beetle elytron from hemipelagite in Early Paleocene deep-sea deposits is significant for taphonomy and suggests long wind transport from lagoonal to open marine environment and disarticulation by predators or scavengers in surface waters. Abstract: Hungary’s deepest borehole, Hód-I, was drilled in 1969–71 SE of the town of Hódmezővasarhely, in order to explore one of the thickest Neogene basin fills of the entire Pannonian Basin (the Makó Trough). The final depth of the well was 5842.5 m. According to earlier analyses of 45 core samples taken from the borehole, the lowermost 700 m was thought to belong to the Middle Miocene (Badenian and, possibly, Sarmatian Stages), whereas the overlying part was believed to belong to the Upper Miocene (deposits of Lake Pannon, Pannonian Stage), Pliocene, and Quaternary. In order to establish a more precise position of the Neogene stage boundaries, we carried out micropaleontological investigations on the 4100 to 5823 m interval (cores 25 to 45). Ostracods have been prepared by solution of the samples in acetic acid. Dinoflagellates were investigated in palynological preparations and in petrographic thin sections. It was found that core 34 (5070–5074 m), earlier thought to represent the base of the Pannonian Stage, in fact belongs to the younger part of the Lake Pannon sequence (Spiniferites validus Zone). Downwards to the base of the borehole, the Spiniferites paradoxus, Pontiadinium pecsvaradensis, and Spiniferites bentorii oblongus Zones were found, all belonging to the Pannonian. Accordingly, ostracods indicated the younger part of the Upper Miocene lacustrine sequence for the upper samples of the investigated interval, and older Upper Miocene down to core 44. Thus, the drilling failed to reach the base of the Pannonian Stage. The huge thickness (>6 km) of the postrift sediments above the relatively thin synrift stages (Badenian and ?Sarmatian) in the Makó Trough corroborates the notion that simple rifting models are not sufficient to adequately describe basin evolution in the central part of the Pannonian Basin. Abstract: The Pliocene-Quaternary Karasar basalt is located in the western part of the post-collisional volcanic field in Eastern Anatolia and occurs as lava flows on the continental sediments. According to normative mineralogy and geochemistry, Karasar basalt samples have hyperstene-normative tholeiites, nepheline-normative basalts, trachybasalts, and basaltic andesites with quartz-xenocrysts which occur at the base of the lava flows. Trace and rare element variations indicate that the trachybasalts are enriched in highly incompatible trace and light-rare earth elements relative to hyperstene- and nepheline-normative basalts. Hy-normative tholeiites have higher concentrations of medium-heavy rare earth elements relative to ne-normative basalts and trachybasalts. The trace element characteristics of the Karasar basalt imply that the quartz-bearing rocks indicate some crustal contributions, but the basaltic samples have a minimal or no crustal assimilation. Th/Yb-Nb/Yb and Hf/SmN-Ta/LaN diagrams coupled with HFSE depletions display a subduction signature in the source region of these volcanics. REE modeling exhibits that the magmas forming the Karasar basalt originated from a spinel-peridotite source, although trachybasalts require mixing between melts from spinel- and garnet-peridotite source. Discrimination plots based on trace element data exhibit a within-plate character of the Karasar basalts. Correlations between trace element ratios (Ba/Nb-La/Nb and Ba/La-Ce/Pb) imply that the source of Karasar basalt is lithospheric rather than the asthenospheric mantle. These data reveal that the Karasar basalt is linked to a post-collisional extensional tectonic regime following the collision between the Eurasian and Arabian plates. Volcanism in this part of Anatolia is consistent with a model in which melting of lithospheric mantle occurred in response to lithospheric extension.